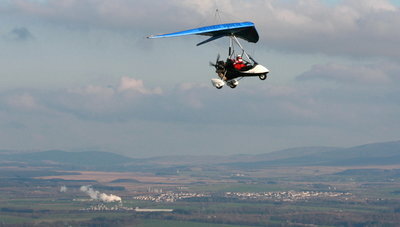 The Mainair Blade 912 was the first weightshift microlight to be flown from the UK to Australia -it is a real "going places" machine. G-RIKI was purchased by us two years ago and recently had a full wing overhaul at the P&M factory where it was first built. We have four "shares" in the aircraft, and there is one available at present. The aircraft is not used by the flying school, so availability is excellent. The idea is that group commit to at least a year. They pay £100 a month, and that covers the annual costs (such as servicing, hangarage and insurance) and it gives them one hour's flying, including fuel. Extra hours that month are charged at £60 an hour for the first two and then £42 an hour after that. So if you were to fly five hours one month, you would get the first one free as part of the monthly payment, then pay £60 for the next two and then £42 each for the others. So that would be £60 x 2 + £42 x 2 = £204. If you can't fly the hour that month, you can carry it over for up to two months, so if you don't fly January's hour you can carry it over until March if you want. When you join, you pay a refundable £1,000 insurance deposit. If you are the pilot in charge of the aircraft when it has an incident which might result in a claim, you may forfeit some or all of your deposit. For example, say you accidently tear the wing fabric. If the repair costs £500, we will take that out of your deposit and not claim on the insurance (since it has a £750 excess). If the repair bill comes to £1,250, we may not make an insurance claim (since that would increase next year's premiums) and just take the £1,000 from your deposit and suffer the extra £250 cost ourselves.